Are you in search of well-being, transformation, evolution? Want to overcome a recurring issue or crisis? Are you looking for a way to reconnect to yourself and what matters deeply to you? Would you like to mentally prepare yourself for an important event or be accompanied through it? Do you feel you have gone around your problem and yet nothing changes? French sophrologist and psychotherapist, offering a relational and psycho-physical approach working with both body and mind. Anaïs Leneau welcomes young adults, adults, pregnant women, French speaking clients, to a safe space where they can express themselves verbally, emotionally and physically and be heard with compassion within a respectful, non-judgemental and confidential framework. Listening to your uniqueness and the uniqueness of your story, her approach is above all humanistic and relational. 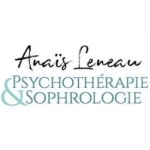 The methods and the modalities that Anaïs Leneau proposes are at the service of your request and your therapeutic process. She adapts them as close as possible to your needs and according to your personality. Sophrology is a short positive therapy, which allows you to take direct action on your difficulties to relieve yourself or free yourself from it. Psychotherapy allows you to find out the "why" of these difficulties in order to deconstruct them, to overcome them and to live a deep transformation. Sophrology and psychotherapy can be practiced separately or in a complementary way according to your personality, your needs and your request. Feel free to visit Anaïs Leneau's website and/or to contact her for an appointment or further information.